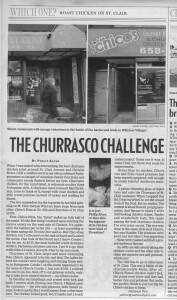 When I was tasked with determining the best churrasco chicken joint around St. Clair Avenue and Christie Street, I felt a sudden swell in my often subdued Portugueseness as images of countless family functions and community events flashed before my eyes. Churrasco chicken, for the uninitiated, is rotisserie poultry done Portuguese style. A churrasco meal is almost like Christmas, come to think of it, except with roast chicken and little round potatoes instead of turkey and stuffing for dinner. The two contenders for the top prize in hot-bird spinning on St. Clair Avenue West are mere steps from each other: Chico’s Pizza at No. 699 and Churrasco of St. Clair at 679. First, Chico’s Pizza. Yes, “pizza” makes up fully half of the name. It’s the first thing I noticed upon entering the narrow eatery on the west side of Christie. It’s apparently the tastiest pie in the city – at least according to the signs saying the Toronto Star said so. But Chico does chicken, too; I refocused on the task at hand and located the menu. One look at the board and I knew Combo 1 was for me. At $6.75, the meal included a half churrasco chicken, Parisienne potatoes and rice. I got it to go, then walked the 84 metres down St. Clair to my next mark. Churrasco of St. Clair, larger and more welcoming than Chico’s, appeared to be the real deal. The ladies behind the counter were laughing and sharing funny stories in Portuguese. Combo 1 on this menu happened to be the same as Chico’s Combo 1, but cost $7.69. I ordered this one to go, too, then off to my getaway vehicle, waiting to take me to neutral territory – my kitchen table. In familiar surroundings and armed with fork and knife, I went to work. First up was Chico’s. I flipped open the container – the rice and potatoes, both tinted orange, looked exactly like I would expect from a churrasco joint. The chicken looked good, too, if maybe just a touch undercooked. Turns out it was. It wasn’t bad, but there was room for improvement. Better than its chicken, Chico’s rice and little round potatoes had been expertly prepared; well enough to evoke blissful childhood memories. A palate cleansing glass of water later and onto the Churrasco of St. Clair container. When I popped this lid, I was surprised to see the muted hues of the food. But no matter: The contest is about flavour, not pigmentation. And flavour is where C of S’s dull-looking chicken shines. Tender and wonderfully tasty, this ranks among the best churrasco chicken I’ve ever come across. The rice was done in the same style as at Chico’s, but was blander. The potatoes were good, but not what I was expecting – these were roasted and had a generic barbecue flavour. So, with one side clearly taking the chicken crown and the other able to claim the superior rice and potatoes, which one? 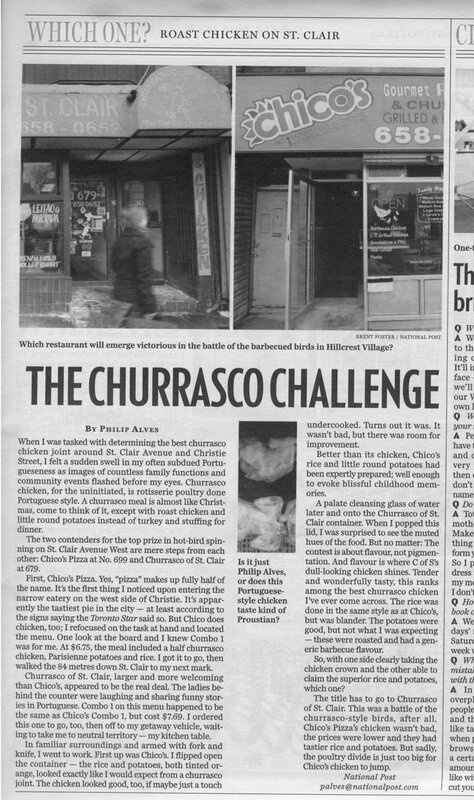 The title has to go to Churrasco of St. Clair. This was a battle of the churrasco-style birds, after all. Chico’s Pizza’s chicken wasn’t bad, the prices were lower and they had tastier rice and potatoes. But sadly, the poultry divide is just too big for Chico’s chicken to jump.